The Central government on Wednesday launched a common admission portal for foreign students to promote Indian education to "200,000 international students by 2023". The portal 'Study in India' was launched here as an initiative by the Human Resource Development Ministry, aided by the External Affairs Ministry. Under the initiative, a total of 160 higher education institutes have been identified to provide education to international students seeking to study in India. Calling the endeavour a "major step forward" to freeing Indian education market for foreign students, the Secretary, Higher Education, R. Subrahmanyam said that about 55 per cent of the total seats on offer at these 160 institutes will come with fee waivers. The venture will include easing of visa requirements for international students. External Affairs Minister Sushma Swaraj, Minister of State for Human Resource Development Satyapal Singh and diplomats from over 30 countries attended the launch. Giving a boost to enroll more foreign students in Indian campuses, the government projected 160 premier universities and institutions, including the Indian Institutes of Technology and Indian Institutes of Management, as an ideal destination for higher education on Wednesday. The government at the launch of the Study in India initiative stated that 15,000 seats are on offer for the 2018-19 academic session, with 55% of these coming with fee waiver. The government is aiming at a two lakh international students in Indian campuses by 2023. Union minister for external affairs, Sushma Swaraj, minister of state for HRD, Satyapal Singh and diplomats from 30 countries were present during the launch. At present, India is hosting around 45,000 international students, which accounts for 1% of the global student mobility. The Study in India launched by the Ministry of Human Resource Development and aided by the Ministry of External Affairs, Ministry of Home Affairs and Ministry of Commerce will initially target 30 “friendly countries”, ambassadors of which were present at the launch. The countries include primarily from Asia and Africa, including Nepal, Vietnam, Kazakhstan, Saudi Arabia, Nigeria, Thailand, Malaysia, Egypt, Kuwait, Iran, Sri Lanka, Bangladesh, Bhutan and Rwanda, among others. “We observed that the number of students coming to India for higher studies had become stagnant and more students were going to countries like Singapore and Australia. That is when we decided to make a single spot information gateway to attract more students, make our visa process hassle free and also offer fee waiver to students,” said Prakash Javadekar, union minister for HRD in a video message. The initiative is similar to the admission exercise conducted by Australia, Malaysia, Singapore and Canada to improve on the share of international students and achieve better global reputation and rankings. Under current provision institutions are allowed to reserve 10% to 15% supernumerary seats for foreign students in higher education. ‘Study in India’, with a sanctioned budget of Rs 150 crore for two years, will promote India as a top destination for higher education and funnel demand in the direction of the supernumerary seats. To woo meritorious international students, the government has also announced a number of fee waiver schemes -- from complete fee waiver to top 25% meritorious aspirants, 50% fee waiver to the next 25% and 25% to rest of foreign students. Calling the endeavour a “major step forward” to freeing Indian education market for foreign students, R Subrahmanyam, secretary, higher education, said that about 55% cent of the total seats on offer at these 160 institutes will come with fee waivers. The venture will also include easing of visa requirements for international students. The portal ‘Study in India’ was also launched on the occasion through the international students will be able to register and apply in all the 160 institutions in programmes of their choice. The Indian Institutes of Technology (IITs) will add 779 more seats exclusively for women applicants in the new academic session this year. SayantSaha, a student from IIT-Kharagpur told ANI that the decision by the institutes will help in improving the problem of gender imbalance in the IITs. "It will help the girl students to get the privilege of higher studies in premier technological institutes. It will also tackle the issue of gender imbalance in IITs," she said. Hoping that the initiative will help in increasing the number of girls in the IITs, IIT Kharagpur faculty member Sudeshna Sarkar said, "Over the next few years, the percentage of girls will be hiked to 20 per cent." "Additional supernumerary seats created over and above girls who were already coming in. Seats to be decided based on the number of girls already in the system. In the coming year, the target is to go up to 14 per cent girls," she added. 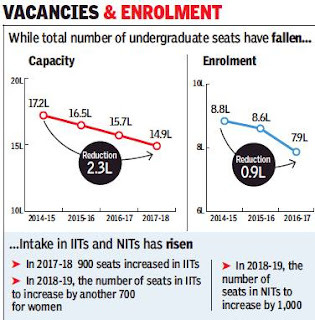 Currently, 9 per cent women are admitted at IIT Kharagpur and this year the seats increased to 14 per cent. There will be around 80,000 less seats in engineering this year. This will lead to around 3.1 lakh seats less in four years, including 2018-19 academic session. Don’t get alarmed. Because actual enrolment has been on the decline since 2012-13, coming down by 1.86 lakh. According to the All India Council for Technical Education (AICTE), nearly 200 ‘substandard’ engineering colleges have applied for closure. Though these colleges will not enrol new students, they will continue to function till the current batches graduate. However, for elite institutions like the Indian Institutes of Technology (IIT) or the National Institutes of Technology (NIT), there has been increase in intake. Now, AICTE has also decided that by 2022, at least 50% of all the programmes in technical institutions have to get their accreditation from the National Board of Accreditation (NBA). At present, around 10% of the programmes are accredited in India. Since 2016, the number of engineering seats has been in decline every year. According to AICTE, it is around 75,000 annually. In 2016-17, total intake capacity at undergraduate level was 15,71,220, of which total enrolment was 7,87,127, which is just around 50%. In 2015-16, total intake was 16,47,155, of which enrolment was 8,60,357, which was 52%. “This year too there will be round 80,000 seats less. Around 200 colleges have applied for closure as they were having very low admissions in the recent past,” said Anil Sahasrabudhe, chairperson, AICTE. The closure of the engineering colleges will, however, not impact the current batches as the colleges would continue to function till the already-enrolled students complete their courses. “The colleges will continue to function till the current batches graduate. However, these colleges will not enrol new students from this year. So, effectively, these colleges will seize to function as engineering institutions from about three-four years from now,” said Sahasrabudhe. According to a senior HRD official, majority of the institutions which are going to face closure have less than 20% enrolment in last three years. “Many of those, in fact, recorded nil admissions. So, even the aspirants don’t prefer these institutions as they are substandard. On the other hand, IITs and NITs have increased their seats and there will be more opportunities here as the new IITs shift to their own campuses. Right now, they are functioning with 300-400 capacity,” the official said. It is up to Indian Institutes of Managment (IIMs) to decide whether they want to award degrees or diplomas to their postgraduate students, according to officials in the HRD ministry. "The decision to grant degree or diploma is to be taken by IIMs. They are free to do so. They have created a strong reputation for themselves, and their academic awards including the Post Graduate Diploma (PGDM) are recognised globally. The ministry will not intervene in it," a senior HRD ministry official said. Parliament had on December 20 passed the IIM Act, empowering the premier management institutes to grant degrees to students. The directors of all the 20 business schools met in the national capital on February 28 to reach a consensus on the issue. IIM Bangalore, IIM Lucknow and IIM Ranchi held their convocation ceremony last month. While IIM Lucknow and IIM Ranchi gave postgraduate diplomas in management or PGDM to their students, IIM Bangalore was the first to award an MBA degree. IIM Udaipur and IIM Indore are also exploring the idea of granting degrees. Earlier, all IIMs were separate bodies registered under the Societies Act. Since societies are not authorised to award degrees, students admitted to their Master's programme were given a PGDM. Similarly, those pursuing doctoral studies are awarded the title of a "Fellow" at the end of their research. Although the PG diploma and "Fellow" title are recognised by the Association of Indian Universities and the HRD ministry as being equivalent to an MBA and a PhD degree, respectively, the equivalence is not universally accepted, especially for the Fellow programme, which prompted the government to conceive the Act. Maintaining its dominance for the third consecutive year, the Indian Institute of Science, Bangalore leads the list of top institutions in the overall and university categories, according to the National Institution Ranking Framework (NIRF) rankings for 2018. IISc Bangalore is followed by Indian Institute of Technology (IIT) Madras, IIT Bombay, IIT Delhi and IIT Kharagpur – the top five on the overall list. Delhi’s Jawaharlal University (JNU) holds on to its sixth position, while Anna University, Chennai is a new entrant in the top 10. NIRF is the only national ranking framework for the country’s higher education institutions. The rankings were introduced by the government in 2016. In the first year, NIRF had four categories of educational institutions -- universities, engineering, management and pharmacy. Two more categories -- overall and college -- were added the following year. This year, another three categories have been included -- medical and dental colleges (single category), law and architecture -- making it a total of nine categories. Some 3,000 applications were received in 2017 -- a number that in 2018 touched close to 4,000. University category: IISc Bangalore, which was number one in 2017, bags the top spot this year. JNU Delhi is in second place while Banaras Hindu University (Varanasi) is third -- both retain their positions from the previous year. College category: Delhi University dominates this category, with five of its colleges featured in the top 10 list. Miranda House continues to be the top ranked college in the country, followed by St Stephens in second place. Hindu College (4th), Shri Ram College of Commerce (7th) and Lady Shri Ram College (8th) are the others that make it to the top 10. Engineering category: Chennai can boast of the having the best engineering college, with IIT-Madras number one for the third year in a row. The IITs, as expected, bag eight of the top 10 engineering slots. Management category: The top four IIMs – Ahmedabad, Bangalore, Calcutta and Lucknow – predictably corner the glory, followed by IIT-Bombay at fifth rank. Pharmacy and Architecture: National Institute of Pharmaceutical Education and Research, Mohali is the premier pharmacy institute, while IIT Kharagpur makes it to another list -- it’s the number one architecture institute in the country. Medical category: Premier healthcare institute All India Institute of Medical Sciences (AIIMS, Delhi) tops the list while Post Graduate Institute of Medical Education and Research (PGIMER Chandigarh) is number two. Law: The top spot goes to a Bengaluru university once again -- the National Law School of India (NLSIU), followed by the National Law University in Delhi. The rankings are important since they reflect the quality of education, encourage competition and help set new benchmarks of performance in the higher education space. Chennai, in particular, has reason to be proud. Recognizing its academic achievements, Anna University is 10th in the overall category. It’s also moved to fourth place from last year’s sixth rank on in the university list. IIT-Madras is another feather in the city’s cap -- it’s ranked the best engineering college in the country and retains its second position in the overall category. Mumbai’s performance has, however, not been up to par. Only six institutes from the city make it to the top 200 under the overall institutions category and St Xavier's is the only one to figure among the country's top 100 colleges, although its rank dropped from 40 to 74. IIT-Bombay has managed to retain its position as the country's third best institute. The Powai institute also ranked as the second best engineering institute and fifth in the management category in India after institutes such as NMIMS and SP Jain. Unsurprisingly, Mumbai University did not figure in the top 100 universities in the country. In fact, the university's position dropped from the 101-150 band down to 151-200. West Bengal is doing better - seven institutes from the state are among the top 50. IIT-Kharagpur leads from the state and is ranked fifth, followed by Jadavpur University (13th position), Calcutta University, IIM-Calcutta, Indian Institute of Science Education and Research in Kalyani and Indian Institute of Engineering Science and Technology, Shibpur – all of which are in the top 50. Punjab and Haryana also make their mark. Five Punjab varsities and one from Haryana are among the top 100. Panjab University is the best university in the region with an overall ranking of 33, while Patiala’s Thapar Institute of Engineering and Technology ranked 50th and IISER Mohali, is close behind at 55th spot. In Telangana, four institutions figure in the top 100 under the overall category -- University of Hyderabad at No.11, IIT-Hyderabad at number 22, the 100-year-old Osmania University at number 45 and the National Institute of Technology (Warangal) at the 78th position. Rajasthan, however, failed to register a significant presence in the NIRF rankings, The saving grace for the state are its two institutes which made into the list of top 100 in the prestigious ‘overall’ category—Birla Institute of Technology, Pilani (26th) and Banasthali Vidhyapith, Niwai (91st). In Assam, in the all-important overall category where all participating institutes have been adjudged, Tezpur University with a rank of 46 and Gauhati University with a rank of 61 have secured berths in the top 100. In the engineering category, IIT-Guwahati is in seventh place. The rankings assume significance as the performance of institutions is linked with the “Institutions of Eminence” scheme, under which 20 institutions both public and private will selected and actively supported to come up in the global rankings. Universities in the IoE group are expected to break into the ranks of the world’s top 500 universities in 10-15 years and eventually into the top 100. The selected universities will enjoy unprecedented administrative and financial autonomy in a wide range of matters, including freedom to admit foreign students up to 30% of admitted students; recruit foreign faculty up to 25% of faculty strength; offer online courses up to 20% of its programmes and enter into academic collaboration with top 500 ranked institutions in the world without permission of the University Grants Commission. They will also be free to fix and charge fees from foreign students without restriction; have flexibility of course structure in terms of number of credit hours and years to take a degree. as well as complete flexibility in fixing of curriculum and syllabus, etc. Apart from government institutions, National Board of Accreditation sources said a large number of private higher education institutions, who were not part of the process earlier, have joined the rankings this year. To make the process more transparent, NIRF has outlined its methodology to rank institutions across the country, drawing from a general understanding of the overall recommendations arrived at by a core committee set up by HRD ministry. This includes student strength including doctoral students; faculty-student ratio with emphasis on permanent faculty; combined metric for faculty with PhD (or equivalent) and experience; and total budget and its utilisation. This includes combined metric for publications; combined metric for quality of publications; IPR and patents: filed, published, granted and licensed (IPR); and footprint of projects and professional practice and executive development programs (FPPP). This comprises combined percentage for placement, higher studies and entrepreneurship (GPHE); metric for university examinations; median salary; metric for graduating students admitted Into top universities; and metric for number of Ph.D. students graduated. Includes percentage of students from other states/countries (region diversity); percentage of women on campus; economically and socially challenged students; and facilities for physically challenged students. Includes peer perception in terms of employers and research investors, academics and competitiveness. But although these parameters appear comprehensive, institutions have raised objections in connection with the methodology. They claim the process lacks transparency. They also feel the parameters are not comparable in different types of institutions. Some institutes feel the rankings go against the grain of their perceived reputations. They also claim government institutes get preferential treatment. Globally, ranking agencies are usually independent. In India, however, the NIRF is backed by the government’s Ministry for Human Resource Development. India may have a large number of youth but most of them are inadequately skilled for jobs. It's truer in case of engineering education. IITians sure have impressed the world but a large number of students passing out of ordinary colleges are not even employable, let alone comparing with their counterparts from advanced countries. India's much-touted demographic dividend, which can help India compete with China in manufacturing in near future, will turn into a burden if employability of graduates does not go up. Prime Minister Narendra Modi's dream project of 'Make in India' is hobbled by lack of employable graduates. The project aspires to increase manufacturing capacity in India and generate 100 million jobs by 2022. That's too difficult with the kind of graduates our engineering colleges churn out. All India Council for Technical Education has started taking steps to update and revise engineering curriculum. It also wants to close down about 800 engineering colleges across India in which admissions are plunging every year. Why did some universities that were recently granted autonomy think they had not applied for it? The Union government has granted autonomy to several public universities in India on the basis of a one-page application form. The application process did not ask for wider consultation among teachers or students, nor did it require the institution to make a detailed case for itself. Consequently, some universities seem to have submitted the data the Centre sought without realising this constituted an application for autonomy. On March 20, Union Minister of Human Resource Development Prakash Javadekar announced the names of five central universities and 21 state universities that had been granted a degree of freedom from the oversight of the University Grants Commission, which regulates higher education in the country. Soon after this announcement, this reporter contacted some of the universities on the list, asking them about the application process for autonomy. 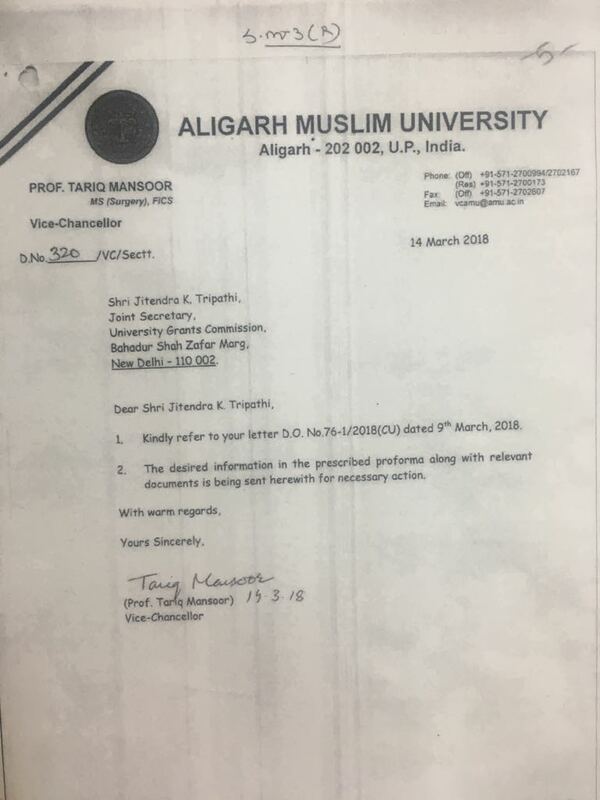 The acting vice-chancellor of West Bengal’s Jadavpur University and the registrar of Aligarh Muslim University insisted that they had not applied for it, and also said that the selection process was not based on applications. 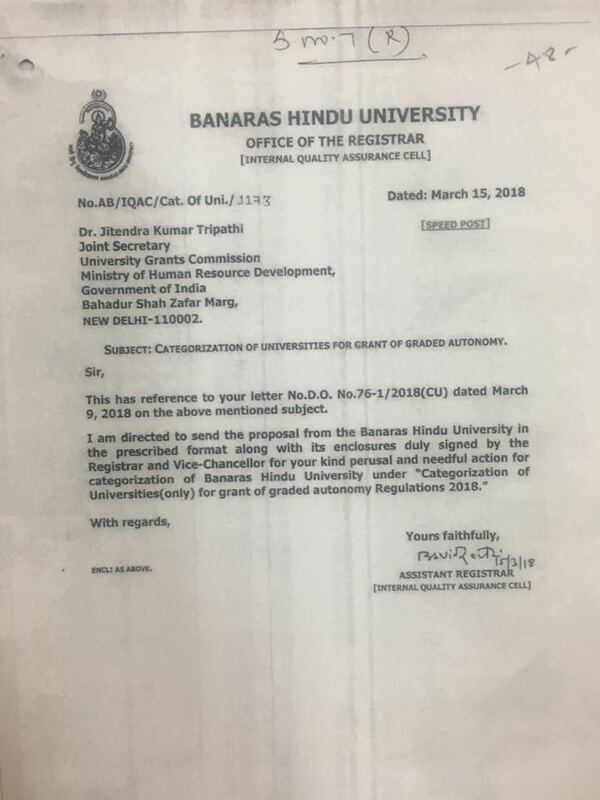 On March 27, Scroll.in wrote to the chairman of the University Grants Commission and the secretary, higher education, Ministry of Human Resource Development, for their version of the process followed in granting these universities autonomy. They did not respond. In a story published on March 31, Scroll.in reported that several universities had been granted autonomy even though they did not apply for it. After the article was published, the University Grants Commission’s secretary, Rajnish Jain, responded, saying that all universities granted autonomy had applied for it. What then explained the confusion among university authorities? 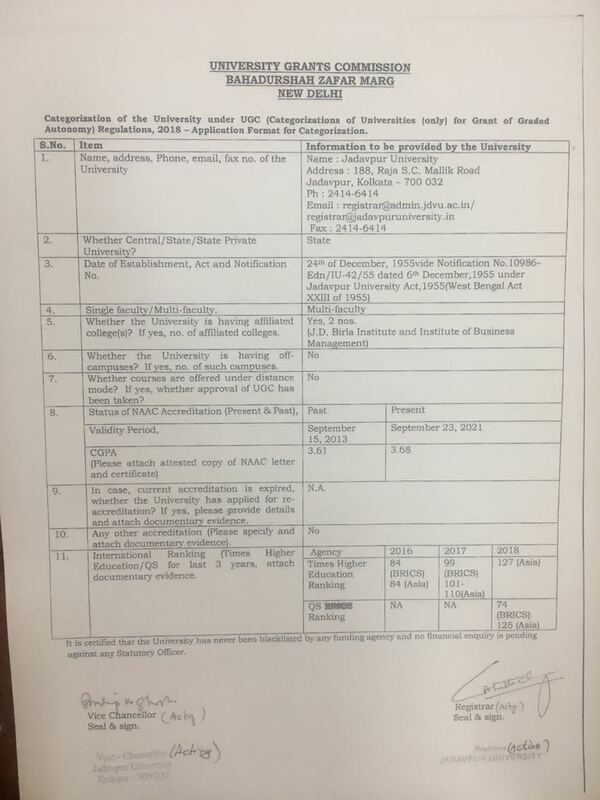 The “application format for categorisation” was a one-page form asking for 11 pieces of information about the university, mainly its accreditation status as per the National Assessment and Accreditation Council, and its ranks awarded by various ranking agencies. 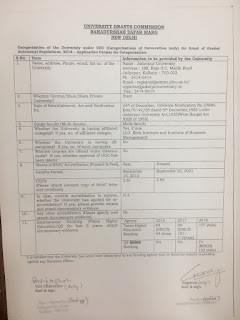 Jadavpur University’s form, furnished to Scroll.in by the University Grants Commission on April 1, was signed by the acting vice-chancellor, Pradip Kumar Ghosh. Yet, on March 26, Ghosh told this reporter that the university had not applied for autonomy. 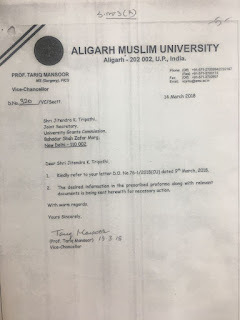 When told that that the University Grants Commission has said that all universities applied, and even provided a letter from Aligarh Muslim University as evidence, Mansoor first said, “We have to check, maybe they had asked us earlier and we applied”. Later, after being specifically asked whether the university submitted any information to the Centre, he recalled sending a sheet of data to the Commission for categorisation. The form universities filled was called an “application format for categorisation”. Besides this phrasing, the scant details required and the speed at which everything was done meant that several university officials did not see this as the application form for autonomy. The Commission’s regulations for autonomy to universities is titled “University Grants Commission [Categorisation of Universities (Only) for Grant of Graded Autonomy] Regulations, 2018”. They were issued in February. According to these regulations, universities are categorised according to their accreditation scores – 3.51 or above out of 4 in category-I, and a score between 3.26 and 3.5 in category-II. Different degrees of autonomy are conferred upon the two categories. They can start programmes and research facilities, recruit foreigners and collaborate with other institutions without seeking the Commission’s permission. The top grade, or category I, institutions are even spared external reviews. The application process for autonomy outlined in the regulations requires universities to “submit a request…for categorisation under these regulations” and the Commission passes “orders on categorisation”. That categorisation will automatically lead to autonomy is implied by the phrase “under these regulations [for grant of graded autonomy]” rather than explicitly stated. This may have been the reason university authorities who remember sending information, and even signed the sheets they sent, did not see what they were doing as applying for autonomy. Scroll.in’s March 27 email to the higher education regulator had also asked officials why some universities said they did not apply and whether their “instructions were clear enough”. The problem of clarity was not addressed in the Commission’s responses, nor did it share the letter inviting applications. 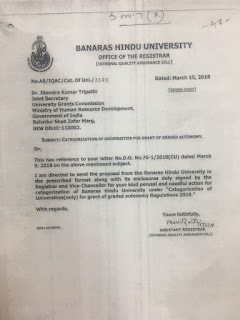 The Banaras Hindu University registrar had also expressed confusion about the programme but the University Grants Commission has shared the cover letter it sent while submitting categorisation data. But things moved much faster on the autonomy programme. It was notified on February 12. On March 9, the University Grants Commission invited applications “only from those universities who were eligible in terms of parameters fixed in the regulations”, said Rajnish Jain, the higher education regulator’s secretary. “All the eligible universities applied and there is not even a single instance where the university was eligible as per the NAAC [accreditation agency] grading but did not apply,” said Jain. The Commission’s regulations require dates for application for autonomy to be notified six months in advance, and applications to be posted online before final scrutiny. But for the first lot, it collected applications and announced the list of selected institutions in under two weeks, on March 20. “They may have rushed this because they realised there would be opposition to the universities being nudged toward commercialisation,” said the Jadavpur University teacher. Jain further said that “as this was the new initiative, the UGC [University Grants Commission] acted in a proactive manner so that the universities are benefitted by the regulations at the earliest, in view of the ensuing academic session” which starts in three or four months. The University Grants Commission has also taken exception to allegations that its graded autonomy policy promotes commercialisation. Jain wrote that it is “not a step towards privatisation” but towards “more academic freedom”. But why were teachers and students who will be most affected by the autonomy decision kept in the dark about the application? Jain clarified that since the grant of autonomy depended on accreditation scores or being listed on university rankings, there was “no need to discuss the application with departments and teachers, nor [were] resolutions…required to be passed in their statutory bodies”. A university’s administration could apply without consulting anyone else. Personalities such as Anand Mahindra, R. Seshasayee, Sajjan Jindal, and former Reserver Bank of India governor Raghuram Rajan came together on Friday to announce the launch of Krea University, which will focus on liberal arts and science courses. These leaders will be associated with the university either as members of the governing or academic councils. Around Rs750 crore will be spent in the first phase of setting up Krea University. Corporate houses and other donors have pledged their support and 70-80% of the amount is already in sight, said Seshasayee, former chairman of Infosys Ltd. He will be chairman of Krea University’s supervisory board. Set up as a private university, it will offer four-year residential honours degrees in arts and science. The first batch will commence in July 2019. “That’s why universities are important...because they are safe houses, because nobody can attack them, because by the act of helping them or sponsoring them, you do create conversations in society. No one can attack a university for doing that,” he added. Rajan stressed on the need to nurture the idea of debate and discussion. “We need to learn to respect universities as places where ideas are debated,” he said. 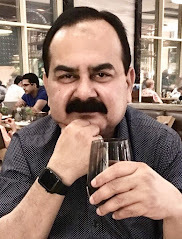 A recent photo posted on Facebook by the Secretary of the Department of Science and Technology, Ashutosh Sharma, featured 41 heads of Indian educational and research institutions. Not one of them, as Shobana Narasimhan, a professor at the Jawaharlal Nehru Centre for Advanced Scientific Research, Bengaluru, pointed out, was a woman. Only 20% of tenured faculty positions in Indian educational and research institutions are held by women. Other numbers are more skewed: only 12 women are Fellows of the Indian Academy of Sciences (there are 197 men); only 3 women are members of the governing councils of centrally funded institutions (there are 83 men). These were some of the startling facts discussed at the first meeting of the Gender in Physics working group of the Indian Physics Association (IPA), held on 22 March at the International Centre for Theoretical Sciences, Bangalore. The International Union of Pure and Applied Physics had set up a Women in Physics working group, back in 1999. Since 2002, it has been conducting the International Conference on Women in Physics every three years and also workshops which come up with recommendations and resolutions. At this conference, teams from various countries make presentations and share their experiences of how the gender disparity in physics can be addressed. For Neelima Gupte, a professor at IIT Madras, the 2002 conference was an eye-opener. “For a long time, we hadn’t realised that many of the issues we faced were actually gender discrimination issues,” she said. Prajval Shastri, Professor, Indian Institute for Astrophysics, who also attended these conferences, found that every country except India had a working group. So on Women’s Day 2016, she and others made a proposal to the IPA to set one up, which she now leads. An immediate outcome was that in March 2017, Resonance, the undergraduate science education journal; Physics News, the newsletter of the IPA; and Current Science, the flagship journal of the Indian Academy of Sciences, all published issues edited and authored entirely by women. The working group acknowledged that even within the IPA, there’s work to be done. Women are represented poorly in IPA’s decision making committees, and also when it comes to being chosen for its named lectures and awards. Until recently, only one out of the 24 chosen to deliver the CV Raman Lecture had been a woman. At the country’s top graduate school for physics, the Tata Institute for Fundamental Research in Mumbai, only two out of 34 enrolled PhD students in the Department of Theoretical Physics are women. This is indicative of a trend in other top Indian institutions as well, despite that fact that women students make up about 45% of enrolments in undergraduate science programmes nationwide. But the gender gap manifests itself in more insidious ways too. Suchetana Chatterjee, assistant professor at the Presidency University, Kolkata, argued that there is little correlation between performance in competitive examinations that are meant as entrance tests for graduate school, and one’s eventual success in research. She cited a 2015 study that showed that, in the US, a large fraction of the women and minorities who went on to be awarded prestigious research fellowships wouldn’t have had the opportunity to do their PhD at all, had their admission to graduate school been based purely on their scores on the physics GRE. This, she argued, holds in India as well – people from disadvantaged groups, including women, might come to believe that their under-performance in entrance exams implies that they aren’t good enough for research. Bindu Bambah, a particle physicist and professor at the University of Hyderabad, added that this becomes very evident from the interviews which follow entrance exams, where women candidates often display a lack of self-esteem. Sexual harassment was discussed prominently at the meeting, with both the members of the Working Group and the audience admitting that institutional mechanisms for addressing cases of sexual harassment often do not work. Many cases go unreported, the victim being intimidated into silence. Even when harassment is reported, the victim may decide that it’s not worth the “mental stress” to fight a prolonged battle, said Tanusri Saha-Dasgupta, a senior professor at the SN Bose National Centre for Basic Sciences, Kolkata. She spoke of a student who decided to go ahead and press for action against the accused, but no action was eventually taken. That this was no isolated case became clear from the discussion involving the audience members too – institutions tend to protect the accused men. The working group could operate legal helplines but for the fact, as Shastri admitted, that it doesn’t have any funding at the moment. Other problems abound: the difficulty in obtaining medical leave, the casual everyday sexist remarks and insinuations, getting shunted sideways into less important decision making bodies. “The culture of science organisations is such that they do not give entry to women,” felt Anitha Kurup, a sociologist and professor at the National Institute of Advanced Studies, Bangalore. She also felt that scientists and social scientists need to interact more and work together to find better ways to close the gender gap in science and, crucially, that men needed to be involved in these discussions too. Digital India initiative in mind, the human resources development ministry is aiming to give online education a big push, in an attempt to widen the reach of higher education. “When the country is adopting digital in most sectors, keeping education away is not the right approach. Pure online courses—adopted and aided by Indian institutes—will push quality higher education to the masses,” said a human resource development ministry official, who spoke on condition of anonymity. “The UGC is already working on a plan and top educational institutions will be in a better position to tell us about the market demand, the drawbacks if any, and the way forward,” a second government official, who will be attending the meeting, said. The second government official cited above said that the outcome of the meeting will aid in formulating online education rules, which may also find a place in the broader education policy being formulated by the K. Kasturirangan Committee. “The meeting will familiarize the leaders of higher education with all digital initiatives of the government and help evolve action plans for effective adoption and utilization of these digital initiatives in higher educational institutions,” he said. The number of Indian students going overseas for under-graduate and post-graduate studies is expected to increase by 50 per cent over the next five years due to a manifold increase in their family incomes, a placement expert said here on Thursday. "We see, conservatively, a 50 per cent increase in Indian students going to the US and UK for under-grad and post-grad studies over the next five years. This is strongly supported by the growing disposal income of their families," said Rohan Pasari, Co-founder and CEO of Cialfo, a Singapore-based education technology (edtech). Cialfo, co-founded by Kolkata-born Pasari and Singaporean Stanley Chia, has placed more than 90 per cent of its students in top universities in the US and 30 top universities in the UK. Pasari noted the Indian students' strong interests in acquiring international education and experiences for placing themselves in the top range of professionals, both in India and globally. He pointed out the 100 per cent growth seen in Chinese students that entered universities in the US to acquire international education during the early pick up of Chinese economy. "It is the same scenario for Indian students from now," Pasari said. Cialfo, which is in the midst of A series fund raising, is linking up with Delhi-based educational institutions to help Indian students secure places in the US and UK universities, he said. Cialfo's fund raising is supported by Koh Boon Hwee, former chairman of Singtel, DBS Bank and Singapore Airlines, as well as NRI investor Anand Govindaluri of Govin Capital. "We are expecting a strong market support for the A series funding as our edtech start-up has a potential to tap into the massive pool of students from India, China and South East Asia," Pasari said. "We will now reach more students, tapping into the multi-billion dollar a year opportunity of helping Asian students find their ideal university," he said, estimating the annual Asian student market value at USD 4 billion in the UK and US universities. Investors estimate the market value of global students in the UK and the US at USD 80 billion a year. Indian students accounted for 4.3 per cent or 21,000 of the 493,570 international students in the UK in 2013-14, according to the British Council. There were 132,888 Indian students out of the 627,306 Asian students in the US in 2014-15, according to the Institute of International Education (IIE).